Whether you are a professional meteorologist or a weekend weather buff, you love weather data! With an accurate and reliable weather station mounted in your own backyard, you'll have all the data you need to analyze, predict, archive, and share -- and it will be real-time and very local. Easy to set up. 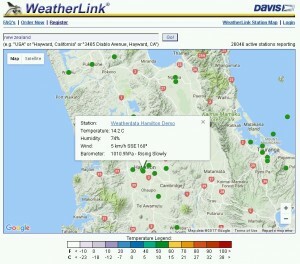 Within minutes of opening the box, your weather station can be up and reporting comprehensive data to your living room. Either the Vantage Pro2 or Vantage Vue are ideal for home use, depending on your interests and budget. Select the Vantage Vue for an all-in-one station that is easy to install and provides excptional value for money. This station will measure air temperature, humidity, wind speed, wind direction, rainfall and barometric pressure. It relays all information back to a display console for real time readings. Add a computer or web interface to store data to a computer or the web. Select the VantagePro2 if you want to add more sensors for horticulture or energy use. The basic system will measure air temperature, humidity, wind speed, wind direction, barometric pressure, solar radiation and rain. It includes a display console where you can view data in real-time.